How to fill AIIMS MBBS Application Form 2019 is a step-by-step guide for filling the application form of AIIMS MBBS 2019 correctly without any errors. AIIMS, New Delhi re-opened the unique code generation facility for final registration process of AIIMS MBBS application form. Candidates can now generate the code and fill the final registration form from March 19 to March 25 up to 5:00 PM. Candidates who will generate the Registration Unique Code (RUC) can participate in final registration. The last date to complete AIIMS MBBS final registration is March 25, 2019. A link to complete the application process is available on this page. LATEST - Code generation facility for final registration process has been re-opened! Click here to generate the code. With the help of how to fill AIIMS application form 2019, students could understand the step-wise procedure of registration. The authority has introduced the PAAR facility (Prospective Applicant Advanced Registration) for filling up the application form. 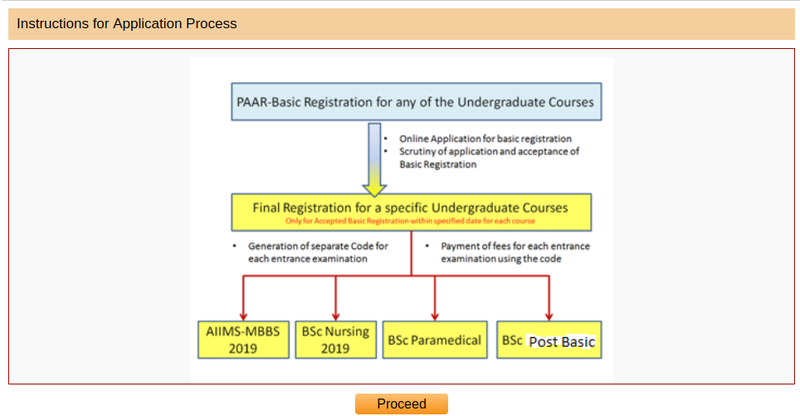 Through PAAR facility, the process of fill AIIMS MBBS 2019 application form is divided into two steps- basic registration and final registration. Careers360 brings ‘How to fill AIIMS MBBS application form 2019’ guide to help aspirants with every step of filling the application form. 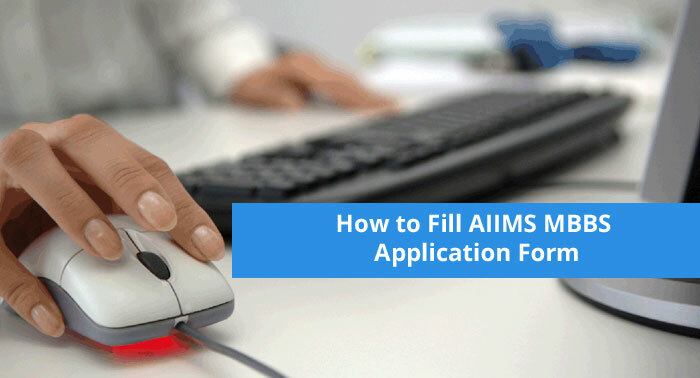 The step-by-step guide of how to fill AIIMS MBBS 2019 application form includes instructions on the uploading of digital documents, choosing the examination centre, eligibility criteria, etc. The instructions guide of how to fill AIIMS MBBS application form is prepared on the basis of official information released by the authority. AIIMS MBBS will be held across two days, i.e. May 25 and May 26, 2019, with two shifts being held on each day. Filling AIIMS application form 2019 is a six-step procedure for basic and final registration, which includes online registration, uploading of scanned images, filling of application form, payment of application fee, choosing a city for taking the exam and printout of the confirmation page. Duplicate applications from one candidate may result in the cancellation of one’s candidature. Therefore, candidates are advised to go through how to fill AIIMS MBBS 2019 application form guide and then fill AIIMS MBBS application form accordingly. Candidates appearing for AIIMS MBBS 2019 must check the dates of application form from the table below in order to avoid missing crucial events. Filling application form of AIIMS MBBS 2019 is a six-step procedure. 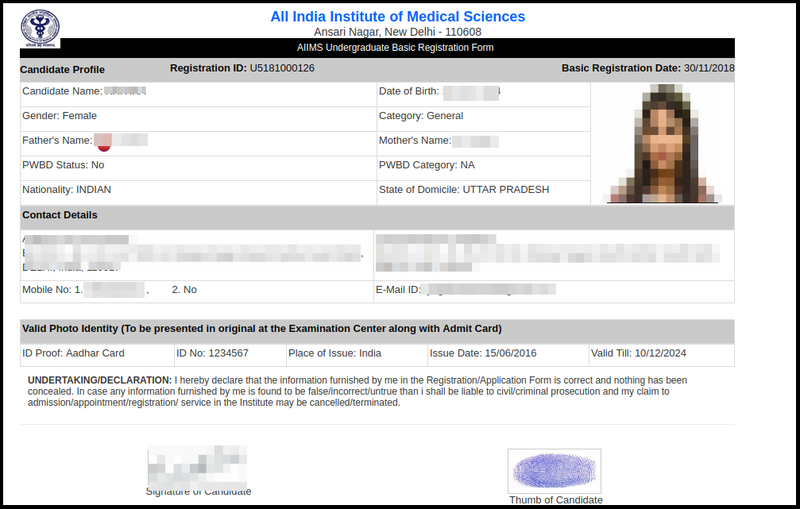 Every step of filling AIIMS MBBS application form 2018 has been explained in detail with screenshots below. Watch given below video to know "How to fill AIIMS UG 2018 Application Form"
Click on the link given above on this page to register for AIIMS MBBS 2019 and fill the application form. For new registrations, aspirants must click on the button mentioning 'Click here for new basic registration' button. Once registered, candidates will be able to directly login to their accounts by entering their candidate ID and password in the applicant login section as shown in the screenshot below. After clicking on the 'Click Here' link aspirants will be re-directed to the instructions page of AIIMS MBBS application form. Candidates are advised to read the instructions carefully before proceeding to the next step. Then, the flowchart to describe the introduction to PAAR registrations will be displayed on the screen. After going through the PAAR registration details, click on 'Proceed' button. Now, aspirants will be directed to the registration page, where they have to enter the personal details such as nationality, name, father's and mother's name, date of birth, category and ID proof details. Thereafter, the system will ask to enter their contact details which includes email ID, mobile number and alternative mobile/landline number. After verifying the details entered, the permanent, as well as correspondence address details, must be entered by aspirants including the country, Pincode, state/UT, district, city and address. Candidates can click on the box provided above on the page, if the correspondence address will be the same. The declaration page must be signed by the applicant which states that the information filled in the form is correct as per the best of their knowledge. Then, click on 'Generate Registration ID and Password'. After successful submission of application, the 'Registration ID' will be displayed on the screen. The provided registration number will also be sent to the registered mobile number and email ID. Click on 'OK' after noting the registration number. 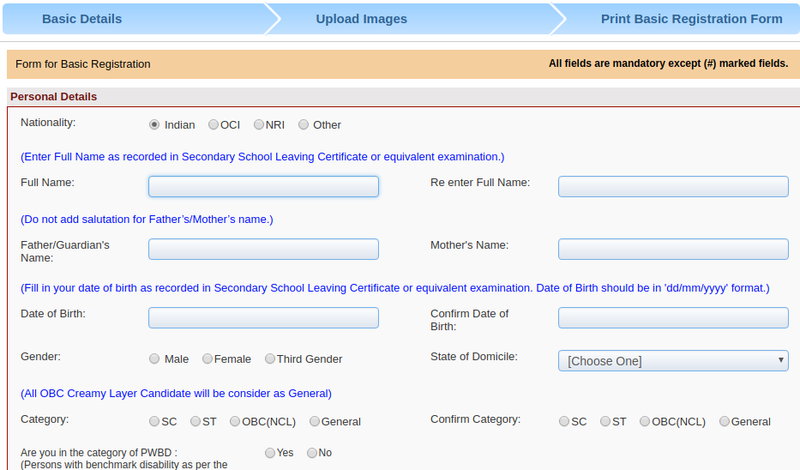 The filled in details provided by the aspirants will be displayed on the screen for verification. After clicking on the register button, ‘Candidate ID’ will be displayed on the screen, which must be noted for future reference. An email and an SMS mentioning ‘Candidate ID’ and ‘Login Password’ will also be sent on the registered mobile number and email ID of the candidates. Candidates will now be required to log-in to the portal with candidate ID and password. Click on the link given above and enter Candidate ID, password and provided captcha code as sent through Email ID & SMS. The system will then display the remaining steps left for AIIMS MBBS application form 2019. In step 2, aspirants have to upload their passport size photographs, signature and thumb impression. The images should be in the white background and should not be blurred. The images to be uploaded must be done as per the specifications mentioned below. Once the relevant documents will be uploaded, candidates will be required to consent to the declaration form and click on 'submit' button in order to complete the basic registration. After completing the basic registration process of AIIMS MBBS application form 2019, a 'Disclaimer' must be accepted by the candidate, which states that the documents and information provided by an applicant is correct and nothing has been concealed. In case any information is found to be failure/incorrect, he/she will be liable for civil/criminal prosecution. After accepting the disclaimer, click on submit button. 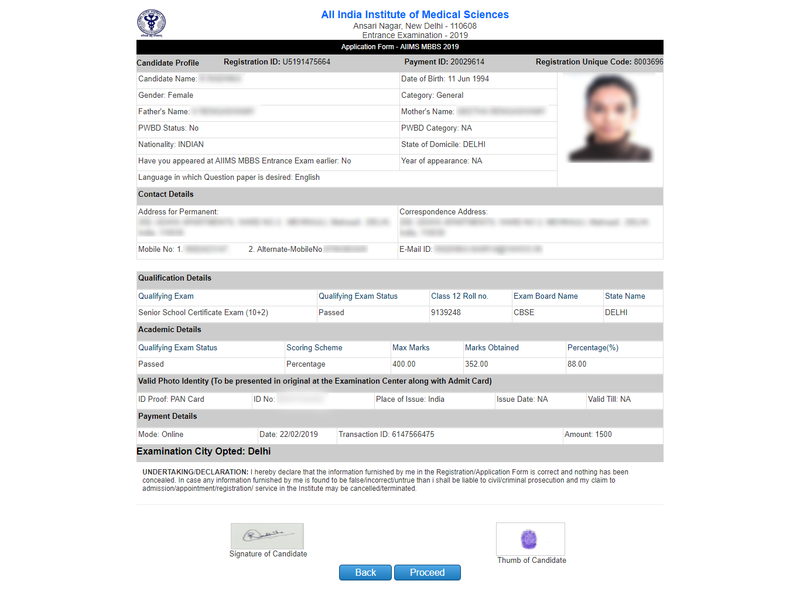 The details filled and uploaded in AIIMS MBBS basic registration process, will be displayed on the screen, which will be used by aspirants for final registration. After the successful completion of the Basic Registration process, the Code Generation will start. In this, candidates whose details submitted in Basic Registration is accepted will be given the facility of generating code for final registration. The facility of code generation was re-opened from February 23 till March 12 for the candidates who were not able to generate the code for some reason. Only those candidates who have generated the code for payment of fees and exam city choice will be eligible to proceed with the next step of AIIMS MBBS 2019 application form. After the completion of the basic registration process, aspirants are required to check their status whether their application form has been accepted or not. After the final status of AIIMS MBBS application forms is released, the final registration process has started on February 22, 2019. In order to complete the final registration, candidates have to login using the link provided on this page above. The screenshot for the same is mentioned below. In the final registration process of AIIMS MBBS application form 2019, candidates have to enter their qualification and address details, pay the application fee, choose the exam city and take a printout of application form. After the aspirants enter the above-mentioned details using the drop-downs, the system will display other qualification details such as board name, state where they belong to and Class 12 roll number, marking scheme (percentage/CGPA), total marks obtained and maximum marks. Once the details are completed, click on, 'Proceed to step 5' button. After filling the application details, candidates are directed to a new window to pay the application fee of Rs. 1,500 for general and OBC candidates, while those for aspirants belonging to SC/ST categories, it is Rs. 1,200 including the transaction charges. The PWD category candidates are exempted from paying the application fee. The prescribed AIIMS MBBS application fee can only be paid in online mode using credit/debit cards or net banking. Note: Before paying the application fee, students can check the availability of seats of exam city by clicking on 'Check City Choice' option. Candidates can check the real-time availability of seats available in their choice of city. It is mandatory to take a printout of payment receipt as a proof of submitting the application fees of AIIMS MBBS application form 2019 by clicking on 'print' button. After proceeding on step 5, candidates then be asked to choose the exam city of their choice. The portal at this point will show real-time seat availability, i.e. the city and seats as available at the time of filling AIIMS MBBS 2019 application form. Select the state from the drop-down list. After selecting the state, select the option of the corresponding cities which appears. Once selected, click on ‘Proceed to Step 6’. The last step is to take a printout of the duly filled application form of AIIMS MBBS 2019. Click on ‘Proceed’ to see the duly filled application form. The filled in application form will appear in this step with the choice of the exam city as was selected and other details including images uploaded in step 5. In case one needs to edit any details, click on ‘Back’ button. Otherwise, click on ‘Final Submit’ button given at the bottom. On final submission, an acknowledgement email will be sent from AIIMS to the registered email ID of the candidate on successful submission of the application form. Mode of Submission - The application form of AIIMS MBBS 2019 can be filled and submitted in online mode only. Mobile Number and Email ID - Registration is the first step of filling AIIMS MBBS application form. Candidates will be required to enter a working mobile number and email ID at the time of registration. Candidate’s login credentials will be sent to the entered mobile number and email ID, which will also be an indication of successful registration. 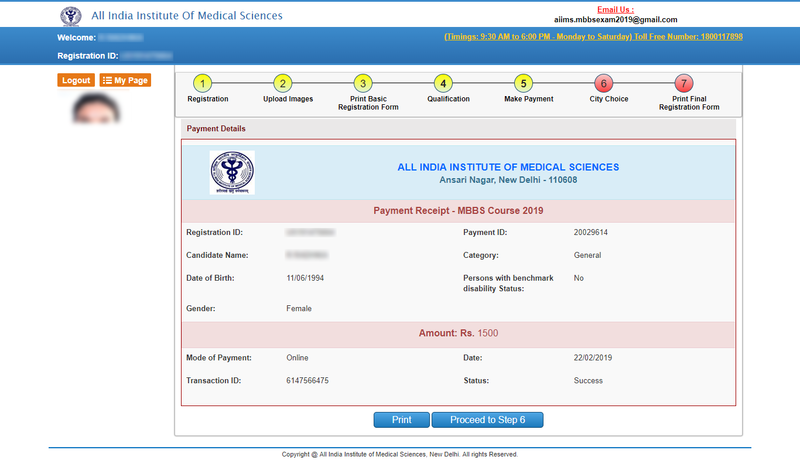 Application Fee & Mode of Payment - The fee of AIIMS MBBS 2019 application form can only be remitted through online modes namely Credit Card, Debit Card or Net Banking. AIIMS MBBS 2019 application fee for general and OBC candidates is Rs. 1,500 along with transaction charges, while for SC/ST aspirants, it is Rs. 1,200 with transaction charges. Candidates belonging to ‘People with Disability’ (PwD) category are exempted from payment of any application fee. Documents to be uploaded - Candidates will be required to upload their digital photograph, signature and left-hand thumb impression while filling the AIIMS MBBS 2019 application form. Choosing the Exam City - Candidates will be required to choose the city in which they wish to appear for AIIMS MBBS 2019. The conducting body will then allocate the exam centre in the candidate’s choice of exam city. The option to choose the exam city of AIIMS MBBS 2019 will become active only after registration and payment of application fee. Eligibility - As per the age criteria, a candidate should complete at least 17 years of age as on December 31, 2019. As per education criteria, only those candidates who have passed/appeared/appearing Class 12 with Physics, Chemistry, Biology (PCB) and English as subjects and those who score at least 60% (50% for SC/ST and 45% for PwD) in aggregate with PCB and English taken together will be eligible to appear for AIIMS MBBS 2019. Candidates will be automatically logged out after completion of AIIMS MBBS 2019 application form filling process. The admit cards of candidates, whose application forms will be accepted by AIIMS New Delhi, will be released on May 15, 2019 and will contain the address of the exam centres in the exam city of their choice among other details.